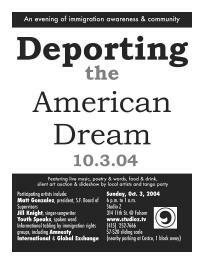 An evening of immigration awareness and community, featuring live music, poetry, silent art auction etc. Participants include Matt Gonzales, President of the SF Board of Supervisors, and Amnesty International and Global Exchange. A benefit event. 6pm – 1am, STUDIO Z, 314 – 11th Street @ Folsom, San Francisco. $7-$20 sliding scale.